Knoco stories: What's the relationship between communities and topics? What's the relationship between communities and topics? Imagine you have an area of knowledge which you believe needs better management. How do you decide whether this merits a community of practice, or whether it should be a topic for discussion within a community of practice? 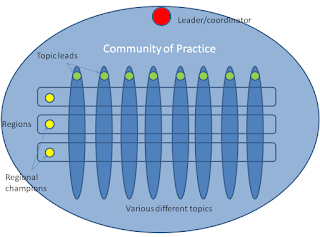 We often see proposals for communities of practice. Sometimes we know these are good proposals which will result in long-lived vibrant communities; sometimes we think they are just topics which a wider community can discuss, and which will not survive as a stand-alone. Any one community can discuss multiple topics. As a keen gardener, I often browse the online gardening communities of practice and interest. There are discussions on many matters - when to plant your beans, how to deter rabbits, which trees are best for hedging. As a gardener I can be interested in any of these topics. Some I skip, some I browse, some I search for. I would rather be part of one larger gardening community, than three smaller ones on vegetable gardening, pest control and arboriculture. These larger communities can discuss multiple topics within the same community, this gives not only a wider membership, but also a wider source of knowledge (I do not count myself an arboriculturist, but I have some experience I can share in hedge control). They also give the lurker a much wider range of things to lean about; all within the topic of gardening. At work, your communities of practice will not be about hobby gardening, but about work topics. The best way to arrange communities is around professional job families - about things people do on a day to day basis, and topics people self-identify with. The "I am" test is an excellent way to screen prospective communities of practice. "I am a knowledge management professional", "I am a geologist", "I am a copier repair technician" - that's the "I am ..." test for a community of practice. A community of practice for topic X will work, if there is a group of people who say "I am an X professional" - if they self-identify with the topic. The self-identification creates a sense of community - a group of people who identify with the topic will identify with each other. There comes a sense of belonging which drives the openness to sharing. Communities should be about day to day jobs. Communities rely on a critical mass of activity. When they are busy, people check them often, and they grow busier. When they are queit, people forget about them, and they get even quieter. The activity covered by a community therefore needs to be a continuous activity. One of our clients tried to start a community of practice based around an annual reportiing activity. For 11 months of the year this was quiet as the grave, and it needed to be relaunched every year. Eventaully it was replaced by an online guidance site. (see this guidance about the buzz-level in large communities). 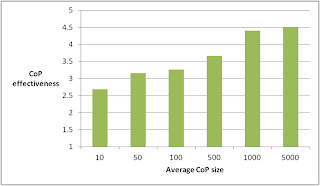 The larger the better, in community terms. 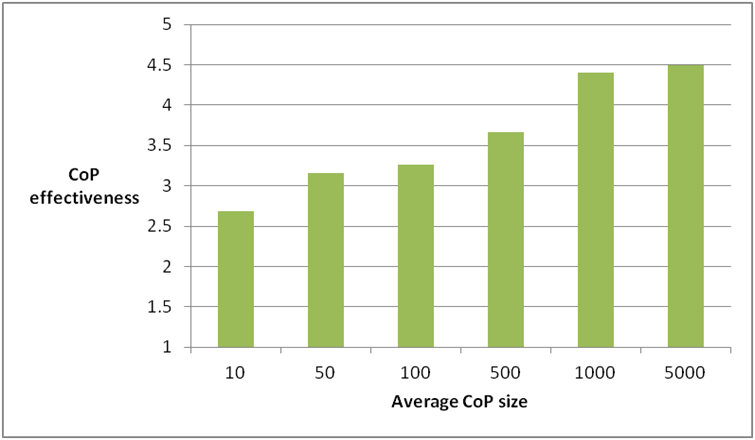 The diagram on the right comes from the Knoco Knowledge Management Survey, and shows how the effectiveness of communites of practice (as judged by the survey respondents) increases with survey size. The power of any network grows with the number of links, rather than the numbner of nodes. Each new person joining the community is one new person, but one new link to every existing person. Therefore the best communities are the largest ones, provided they pass the tests of self-identification. Better to have one community of gardeners talking about many topics, than many smaller communities each with one specialist topic. When Shell started communities of practice, they went for the "more is better" model, and within the first year or two had over 300 communities of practice in existence. They quickly realised that this did not work, and amalgamated these smaller communities into three very big ones (drilling, geology/geophysics, and engineering) and a few more modestly sized ones (legal, finance etc). The diagram below shows the structure in the larger communities, which may have a couple of thousand members each. Each geographic region has a champion for each community, to raise local awareness and activity levels. The Shell communities have been going for nearly 20 years, and have added huge value to Shell.